23 white metal casting parts for assembly and painting. An Isolated figure taken from their earlier dioramas this mounted cavalryman standard bearer I seen on a steep decline on his pony whilst trying to hold his flag aloft – a very difficult proposition! Seen riding back in his saddle this 54mm sculpt will go along with andrea’s other great sculpts from this series in the same scale to make a dio completely of your own. 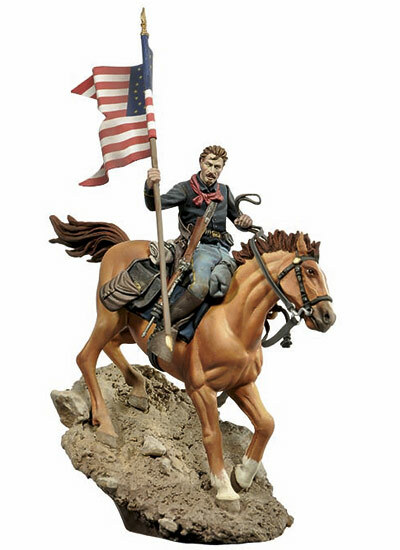 His early American flag flutters as he struggles to sit upright tin the saddle – it is clear the sculptor has a keen eye for balance and co-ordination with body language of his subjects. The inspiration from this is surely the pyn-up art of Gil Elvgren - his girly painting of just this scene is so well replicated and painted up by Andrea’s artist this just looks like the boxart almost! This sculpt consists of 10 white metal casting parts for assembly and painting to your tastes – I suppose it is up to you if you want to alter any of the colours of say the hair, dress or… the crocodile? You can get this sweet lass and her snappy companion painted up in high quality by Andrea’s artisans on their website if you wish – though the excuse to stay at the workbench painting for a long time has to be tempting! 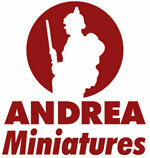 These two figure and the rest of Andrea’s Miniatures are available from their sites and distributors.